A fighter aircraft’s lethality in air-to-air combat is governed by the air-to-air missile that it carries. Since independence, the Indian Air Force (IAF) has mounted French, Russian and British missiles on its fighters. 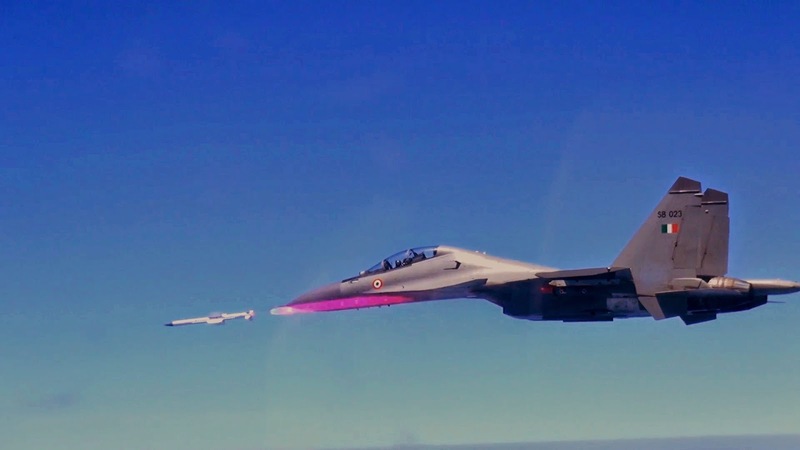 Today, an IAF Sukhoi-30MKI fighter conducted the first test launch of the indigenous Astra air-to-air missile, which the Defence R&D Organisation (DRDO) is developing at its missile cluster in Hyderabad. The Astra air-to-air missile is the smallest missile on the DRDO’s menu, which has achieved notable successes in giant ballistic missiles like the Agni-series. Yet the Astra its amongst the DRDO’s biggest technological challenges. The Astra tested over the sea off Goa today was launched by a Sukhoi-30MKI fighter that slung the missile on an under-wing pylon. Already travelling at several hundred kilometres per hour (the speed of the aircraft at the time of launch) the missile’s smokeless propellant quickly accelerates it to about 4000 kmph in an operational launch, as it screams towards the target fighter. 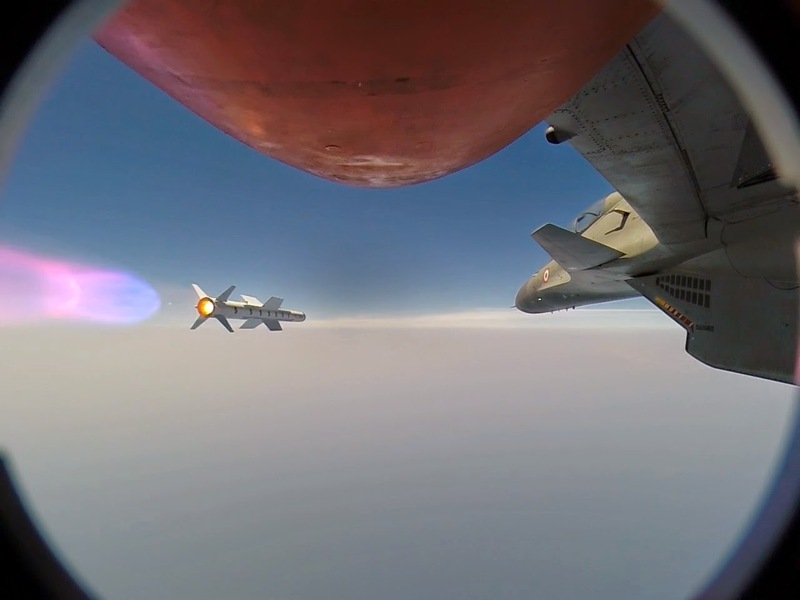 A data link with the Sukhoi-30MKI continuously updates the missile, steering it towards a target that might have detected the missile and is manoeuvring to get away. At 15 km from the target, the Astra’s on-board seeker picks up the target and homes in on it. Reaching near the target, a radio proximity fuze detonates the Astra warhead metres from the target, shooting it down. The launch at Goa today tested only the separation of the missile from the Sukhoi-30 fighter. As testing continues, the missile will be launched against an actual target, and perform increasingly difficult manoeuvres that ensure the target cannot get away by twisting and turning at high speeds. “The air-launch was captured by side and forward looking high-speed cameras and the separation (of missile from aircraft) was exactly as per the simulation,” said a DRDO press release, after the Sunday test. Key components of the Astra missile --- such as the seeker head --- remain imported. A seeker is being developed, but will take a decade to be usable. The air launcher, a rail on which the missile hangs and from which it is launched, is a Russian Vympel launcher that is being built in India. It will allow the Astra to be fired from all four of India’s current generation fighters --- the Su-30MKI, MiG-29, Mirage 2000 and the Tejas Light Combat Aircraft. Astra components that the DRDO has successfully developed indigenously include the data link between aircraft and missile, its on-board computer, inertial navigation system, the radio proximity fuze, and the fibre-optic gyroscope. The current version of the Astra will be followed by a longer-range Astra Mark II, which can be launched at enemy fighters 80 kilometres away. The Mark II, which will have a state-of-the-art ring-laser gyro, is expected to be flight tested later this year. So it is not a fire and forget.. As it is, the Su-30 is a large t arget. Keeping a lock on the enemy plane all the time would mean bad consequences for the Su30. "All Astra systems except the RF seeker are made in the country. The seeker too will be produced in India under a transfer of technology programme. Once fully operational, Astra will be much cheaper than contemporary BVR missiles," said an official. In "Behind the Enemy Lines" the missile is a Surface to Air Missile (SAM). Whether a missile is "fire-and-forget" or has to have the target designated depends upon whether is it launched from beyond the seeker's maximum acquisition range. If you launch the Astra from under 15 km, the fighter does not have to track the target. This is true of all air-to-air missiles. You are quite right, it was a ground launched missile. I've made the correction in the article. presently there are various ambiguous reports all around concerning the range of the missile. could you kindly confirm as to the stated 44 km range corresponds to what launch altitude. So who manufactures the engine?? Is it brought of the shelf or was it developed in INDIA??? While kudos for the first step towards a made in India BVRAAM. But this is like a baby step. Astra's current range is max 40kms...and tested ones so far only at 30kms. Even the so called Astra II is aiming at 80kms. Most American...European...Israeli...Russian missiles have docked in 100kms long back. While I am not sure but there was a huge hue & cry abt Pakistan being supplied the F16s with BVRAAM of 100kms range. The whole system of Astra is at the current measurement a big step towards developing something...which is a complete obsolete tech. Forget Americans, Europeans, Russians & Israelis...with whom we will never have a war or near to war situation. But even freely delivered Pakistani F16s will be able to shoot us down from 100kms or even safely from 80kms. While our pilots will be wasting time evading and saving their machines by uaing the so called superior air maneuverability of SU30MKIs. Pls test and implement a 80 to 100kms system or import them...rather than putting both our pilots & the aircrafts in harms way! DRDO pls take credit for something which is some whr worthy...not for something which is so obsolete!!! I can't understand why alltime Irkut made Sukhois(SB020 to SB050) are used as test platform. Why not with any HAL made one?